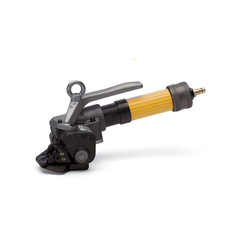 Our range of products include pneumatic operated steel strapping tool. Due to its low weight it does not necessarily have to be suspended. This permits more mobile operation. Ideal for strapping tubes, wire coils and all kinds of small bundles, it is a handy and popular tool in numerous industries. Available in two different tensioning levels. 3/8 - 3/4 x .015 - .025"